JONATHAN: Hey everybody, Jonathan Bailor back – with another bonus Calorie Myth and Smarter Science of Slim Show and I am immensely excited about today’s show because I received a package in the mail the other day. I say package intentionally, because it is not an envelope, it was one of those USPS large flat rate boxes and I was like what in god’s name is this? I was not expecting a box to come in the mail. I’m like, this is a heavy box, like Christmas. I’m shaking it. I’m like ah — what’s in here, what’s going on? I open it up and out falls one of the most impressive books I’ve literally ever seen in my entire life. It is like a hybrid between a textbook and a book like almost like a children’s book. It’s so illustrated and colorful and beautiful and easy to read and then I said, oh, my goodness, who wrote this? And I said I’ve got to get her on the show, come to find she’s already been on the show and she’s an awesome delight, so we just had to have her back, Sarah Ballantyne, PHD, author of this epic book, “The Paleo Approach.” Welcome back to the show. SARAH: Thank you so much for having me. That is exactly the way I asked the designers to design my book. I gave them the instructions of textbook meets coffee table book. And I was like it has to be friendly because I knew I was going into a lot of scientific detail and I said it has to be fun to look at and it has to just feel enjoyable when you’re flipping the pages. JONATHAN: Ah, it’s Sarah and I open up the flap and Sarah you are just a smiley person, I liked it. SARAH: Thank you. I do smile a lot. JONATHAN: But this is the dichotomy because you see this smiley, bubbly, like oh, this is – I then you’re like – oh my gosh – this is like science for real. SARAH: You’ve got to have a couple of puns – yes – I do have a PHD in medical biophysics and I did medical research for four years before my oldest was born and so that’s the background on which all of the information that I was compiling to tell this story of how to manage autoimmune diseases and diet lifestyle. That’s all on the backdrop of I used to do research in critical care medicine in diseases of sort of any immune system gone wild, so I have a lot of background in understanding the immune system and inflammation and I also did epithelial cell biology, just basic biology of how epithelial cells, the (Inaudible 00:04:39) was called polarity so that’s how the cell knows what side of it is the top versus the bottom and that of course is completely what’s going wrong when a person has a leaky gut, which is something that researchers are now beginning to believe this happens in all patients with autoimmune disease. So, it’s a really great background to sort of build – what I had to build on top of that was the understanding of nutrition and the understanding of how certain compounds in our foods then interact with our bodies and how that can potentially contribute to a disease like an autoimmune disease and what are the other factors that go into that because certainly to an (Inaudible 00:5:21) environmental triggers are involved and so to define the role of diet and lifestyle and define the individual’s ability to control the disease with just those factors that are actually in their ability to control because you can’t change your genetics, you can’t change whether or not or you had mono as a kid, but you can change what you eat and you can change how you prioritize sleep and manage stress and whether or not you spend time outside and to pull all of the research in those topics together was a large task, but it was actually really fun for me. This is the kind of stuff that I really geek out over so I really enjoyed writing this book. JONATHAN: I was going to ask you about the amount of time it took to put this together because it truly is – there’s a description on the back from my good friend, Dr. William Davis, and the first word of his endorsement is encyclopedic and I can’t think of a better term and the thing that I wanted to ask about here Sarah is clearly this is the one stop shop for an individual who is struggling with an autoimmune disease, but personally for example, like I get a lot of books in the mail, we’re talking about this before the show and I’ve never had an autoimmune disease, but this is one of the books that I received in the mail that I am going to read. I’m not again saying that to butter you up, like this is an impressive book so really– I mean it says Paleo on the title, obviously it is in line with Paleo principles, but I haven’t had a chance to read the whole thing yet, but in addition to being a great resource for individuals who are struggling with autoimmune disease and in addition to being a great resource for individuals who like the Paleo lifestyle, could you have titled this book, Modern Nutrition 101? SARAH: I really could have. I think what is a little bit misleading about the title of this book is that I do focus on autoimmune disease and I draw from the autoimmune disease literature in forming my arguments whenever possible in this book, but there is so much just basic nutritional sciences and I really decided that because my target audience was not necessarily members of the Paleo community, but the more general autoimmune disease community and so those are people who maybe aren’t coming from a Paleo diet background and I really wanted to go back to the principles of nutrient density which I know you’re a big fan of. Nutrient density is my first stop on the road to explaining how diet can contribute to autoimmune disease. I went back to those basic principles, how the nutrients that we are supposed to be getting from food and maybe aren’t getting enough of depending on what we’re eating support the immune system and what happens if you don’t have sufficient zinc or sufficient Vitamin D and how that basically undermines the immune system’s ability to regulate itself. And then I talk about the development of leaky gut and not just foods that can cause it, but lifestyle factors, overtraining, or doing too much or any overly intense strenuous exercise, not managing stress, not getting enough sleep and tying those lifestyle concepts in and those are things that are applicable to everyone. Understanding how the nutrient density of your diet and in your lifestyle choices impact your immune system it’s just basic science and it’s not something that requires a genetic predisposition to the certain type of disease to apply to you so I would actually go so far as to say the majority of this information in this book is very broadly applicable. I’m quite clear when there’s instances that would apply to someone with an autoimmune disease and the particular genetic predisposition on autoimmune disease versus something that wouldn’t apply to a healthy person and that information is actually all in there so you can actually see (Inaudible 00:09:46) recommendations beyond a Paleo diet recommended for people with autoimmune disease, but you get that whole, the modern science understanding how the nutrient density of our diets impacts our health and how certain compounds can stimulate the immune system and that’s just as far as we know from current scientific studies, it seems to be broadly applicable to everyone. JONATHAN: Absolutely. There’s a couple of reasons why I really dug this text and I couldn’t put my finger on it until just now, but you mentioned something that jogged my memory and what I like about what you’ve done here is it is the complete picture and every time you cover sleep, you cover stress, you cover family stuff, but you also cover the why and the mechanisms – so often especially in wellness books. We get antidotes and we get a little piece of the puzzle and it becomes a very, very confusing because it’s just like these little isolated things and we don’t understand the why behind them or the over-arching system and your book it totally – goes through the entire system which I like. SARAH: I’m a person who finds it a lot easier to make the right choice in my life if I really understand why. The reason I wrote this book – I really wrote this book for me 20 years ago. If I had had this book at my fingertips 20 years ago, I think my health would have evolved quite differently and I think I’m not alone in that. I think that there is many, many people out there who are really hungry for understanding really the why. It makes it so much easier to do the practical implementation when you really understand how going to be an hour later is going to impact your hormone systems and it impacts your immune system and make you hungrier the next day and deregulate your hunger hormones. It’s going to affect your immune system and I think that it’s easier to make healthy choices – well first of all, when you really actually know what healthy choices are and second of all, if you understand why those are the healthy choices – I think there’s so much misinformation out there in terms of what leads to a person being healthy and happy that I feel like the only way and I know this is sort of your philosophy as well, the only way to really cut through all that misinformation is with something that is so based in fact and temporary science. JONATHAN: And you do a great job of balancing what’s called the theory with the practicality because for example, I love the theory and because the understanding and the why. I like to use the analogy of trying to drive without understanding the laws of traffic. If you understand traffic laws, like I can give you directions. I can tell you how to get from your house to the Farmer’s Market down the street, but anytime you want to get anywhere you’re going to have to ask somebody and you better hope to god that they know what they’re talking about, because if they don’t, you’re just taking their word for it and you’re probably going to need someone in the car to guide you every step of the way because you don’t actually know, you’re supposed to be on the right side of the road versus the left side of the road and it just becomes complicated, whereas, if you just understood a very somewhat simple basic set of principles and systemic characteristics, then, pretty soon you can get from your house to anywhere without too much struggle. Is that fair? SARAH: That’s very fair. That’s why actually the whole second half of my book is really focused on practical implementation and resources things like food lists, and then strategies. I really feel like Chapter 6 is just one big brainstorming session. Like we’re just going to sit down and we’re going to figure out what small changes you can do that are going to add together to make a really big impact in your ability to regulate your hormones and regulate your immune system and you don’t have to do all of these things, but here is like a huge collection of practical ideas and you may be able to do half of them and have a huge improvement from that half and then maybe in a little while some of these other ideas will be a little bit more approachable for you because you’ve already made these other changes. I’m a really big fan of sustainability and making changes that are sustainable for the individual, how that person approaches change. It’s going to change from person to person. Something different is going to work for every person and so I really present a lot of different strategies and ideas for transitioning to the diet recommendations, where the gray areas are, but also all of the lifestyle changes so that someone can make it work within their life because I can, I could say what everybody’s idea should be, but it’s not necessarily going to be practical. It’s not going to work for a shift worker. If I don’t give that person some alternative strategies, then they just wasted $40.00 on my book. JONATHAN: And so you mentioned it’s $40.00, but folks, I have a little bit of a (tape mute 15:24) on our guest, I am checking out this book and it’s got these very concrete tips and then when you flip to Page 382, there is a table of the amino acids found in certain foods, like we always talk about on this show, we talk about leucine and how leucine is involved in (Inaudible 00:15:41) well, if you didn’t know now, now you know that for example, moose is a fairly good source of protein and I didn’t know that, but it is. SARAH: Yeah, part of the resources for that I wanted to provide for people if they were making diet changes because micronutrient deficiencies are so common in autoimmune disease and I am not a big fan of supplementation, but there’s a time and a place and definitely there can be situations where it’s very, very useful, but as far as dealing with micronutrient deficiencies I’d far rather see them work on digestion, which would involve both behavioral changes and also potentially digestive support supplements, but then really just focus on foods that have what they’re deficient in because when you have a whole food what you tend to have is (Inaudible 00:16:41). So, you tend to have not just the one thing that you’re deficient in, but maybe its cofactors. You have other nutrients in that food that are going to help absorption or help utilization or prevent toxicity if you accidentally are getting too much and that’s much trickier to get from a supplement. It’s not impossible, but when you seek whole food sources of nutrition, it’s safer, it’s more complete, and you’ll get nutrients from the whole food that you would not even think of that maybe somebody hasn’t measured. SARAH: And so, there are certain situations where supplementation can be beneficial and under the right guidance of a health care professional, but I am a big fan of getting nutrients from whole foods, so I think the tables are like 40 pages of tables of vitamins, minerals, different kinds of carbohydrates, different kinds of fats and yes the breakdown of all 19 amino acids that are in the USDA database, so actually all 20, there’s only 19. The amount that’s in all of the foods that were in the USDA database that I endorse. I couldn’t find crickets. JONATHAN: You’ve gone deep in the gut health thing. You’ve gone deep personally into the weight loss thing, I mean how close is this nutrient density hormonally sensitive neurologically sensitive approach to nutrition to being almost like a theory of everything, but do you think it’s possible to heal your autoimmune disease without also having fat loss ensue because you’ve accidentally reregulated the system in your body that is supposed to help you not gain excess fat. Is it all connected or? SARAH: It’s absolutely all connected. So, I actually have a section, I think in Chapter 7, about weight — not just weight loss — but weight gain because there is a huge segment of the autoimmune disease community of people who are under weight and struggle to gain weight and really the hormones that you’re regulating through not just the change in types of foods that you’re eating, but also things like stress management and getting more sleep and changing the meal times, eating bigger meals, less frequently and not snacking, all of those things are tied together and not just the immune system, but to metabolism, to neuro transfer information. It’s incredibly linked to just emotional health and so one of the things that happens without trying is that people who are overweight tends to lose weight. People are underweight tend to gain weight. So, one of the things I keep bringing back in this book is – oh and by the way this also happens to be the exact way to eat for managing obesity, Type 2 Diabetes, reducing cardiovascular disease risk factors, oh and by the way this is also been shown to reduce a chances of cancer, of stroke and really it comes down to nutrient density and gut health. If I’m going to break into two major concepts it would be getting the nutrients that your body actually needs to function and having an intake functional gut barrier so that you have the right diversity and numbers of bacteria living within your gut, because they also (Inaudible 00:0021:18) with your body. Those bacteria can even produce neurotransmitters which then sends signals to your brain that can turn on or off depression, so you can definitely want to look after your gut bacteria and you want the right barrier between what’s inside your gut and what’s inside your body. I mean have those two pieces in place. It’s like dominos, but good dominos, not all the dominos falling unless I guess it’s falling into place. It just brings everything together, so it’s just plain old conducive to health. JONATHAN: I love it. I love it. Well, if you want to read a book that is going to be conducive to health, this one of the few books I am going to be reading cover to cover, I am a big of it, it is called, “The Paleo Approach,” and Sarah what is next for you on this journey? SARAH: I am taking a little bit of time to actually write for my blog which has been not too badly neglected, but slightly neglected over the last 15 months while I worked on this book. That’s thepaleomom.com, which is where I started my science adventure writing. I’m also working on a companion cookbook which will be released in August and it contains 150 recipes, which will just help people I think feel more comfortable in the kitchen with a different sort of set of groceries than they’re used to buying. JONATHAN: Brilliant. Well the website again is that thepaleomom.com? SARAH: Ah – thank you so much. JONATHAN: Well, Sarah, thank you again and listeners, I hope you enjoyed this conversation as much as I did and truly – honestly, go grab a copy of “The Paleo Approach.” It is a great book and remember – this week and every week after, eat smarter, exercise smarter and live better. Chat with you soon. Sarah Ballantyne, Ph.D. (a.k.a. The Paleo Mom) is the blogger behind the award-winning blog www.ThePaleoMom.com, cohost of the top-rated and syndicated The Paleo View podcast, and author of two upcoming books The Paleo Approach and The Paleo Approach Cookbook. discussions relevant for paleo families and kids’ health, and recipes that span the gamut from kid staples, to comfort foods, to quick & easy meals, to gourmet dishes, to treats for special occasions, to snacks and nut-free baking, to recipes compliant with the autoimmune protocol for those who suffer from autoimmune diseases (like Sarah). 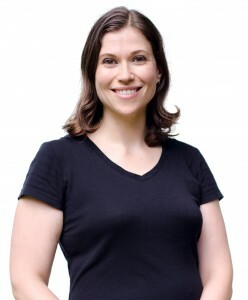 Sarah started her academic career in physics, earning an Honors Bachelor of Science with Distinction from the University of Victoria, Canada in 1999. Her honors thesis work was in radiation therapy for prostate cancer, which prompted her to look for medical research applications in graduate school . Sarah earned her doctorate degree in medical biophysics at The University of Western Ontario in 2003, at the age of 26. Her doctoral thesis was titled “Progressive Liver Injury during the Systemic Inflammatory Response Syndrome: Heme Oxygenase as a Therapeutic Target”. Her doctoral research spanned the gamut of inflammation, innate immunity, endogenous anti-inflammatory and anti-oxidant enzymes, gene therapy techniques, microcirculation and vascular biology, liver health, and critical care medicine. Sarah spent the next four years doing medical research as a postdoctoral fellow first at in the Cardiology Department at St. Michael’s Hospital in Toronto, Canada and then in the Department of Cell Biology at The University Of Arizona. In Toronto, Sarah continued her research in the fields of innate immunity, inflammation, vascular biology, critical care medicine, and gene therapy, with a new focus on Acute Respiratory Distress Syndrome and the role of angiogenic growth factors in controlling inflammation and the innate immune system. In Tucson, Sarah switched gears and studied epithelial cell biology with particular focus on trafficking of proteins required for tight junction assembly, maintenance of epithelial cell polarity, and characterization of a new tumor suppressor called endotubin (which suppressed epithelial to mesenchymal transformations through maintenance of tight junction integrity). Sarah’s focus included cell trafficking (how cells shuttle proteins from one part to another in a targeted way) and cancer biology. Throughout Sarah’s academic career, Sarah earned a variety of awards, including: awards for research excellence including from the American Physiological Society (3 years in a row) and from the Canadian Institutes of Health Research / BioContact Quebec (1st place); many fellowships, including from the National Science and Engineering Research Council of Canada (NSERC), the Canadian Heart and Stroke Foundation (HSF), Pfizer Canada (through HSF partnership), and the Canadian Institutes of Health Research (CIHR) Strategic Training Initiative in Cardiovascular Health Research (TACTICS); and, a research grant through The University of Arizona Cancer Center Gastrointestinal Specialized Program of Research Excellence (GI-SPORE, a National Institutes of Health grant program). Despite Sarah’s relatively short academic career, she filed one patent (in both the USA and Canada) and published 14 papers in peer-reviewed scientific journals (including 7 first author papers; and 12 of which can be seen here), several of which continue to be highly-cited today, and 25 abstracts presented at international conferences. Even though Sarah was enjoying a successful and vibrant burgeoning academic career, she opted to become a stay-at-home mom upon the birth of her first daughter. Sarah’s decision to give the world of medical research a break when her first daughter was born was inspired both by the profound influence her own mother during her upbringing and by a recognition that her health was not going to accommodate any attempts at finding balance between a high-powered academic career and her desire to be a fully-engaged parent. At the time her first daughter was born, Sarah was morbidly obese and suffered from over a dozen immune- and autoimmune-related diseases. Summer 2005–at least 275lbs, but I will never know for sure because I was too scared to weigh myself. I was depressed and very sick. After her second daughter was born, Sarah discovered the Paleo lifestyle. It had an amazing effect on her health, including contributing to her 120-pound weight loss! Over time, she healed herself of a long laundry list of physical complaints including: Irritable Bowel Syndrome, acid reflux, migraines, anxiety, asthma, allergies, psoriasis and an autoimmune skin condition called lichen planus. In fact, Sarah was able to discontinue six prescription medications, some of which she has been taking for 12 years, within two weeks of changing her diet! 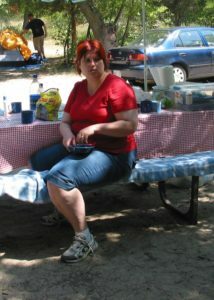 The dramatic improvements in Sarah’s conditions convinced her never to revert to her previous eating habits. She quickly became a passionate and enthusiastic advocate for the Paleo lifestyle, which led to the creation of this blog. Summer 2012. Happy, healthy, fit. Sarah is passionate about scientific literacy and about distilling scientific concepts into straightforward and accessible explanations. As a scientist both by training and by nature, Sarah is deeply interested in understanding how the foods we eat interact with our gut barriers, immune systems, and hormones to influence health. Sarah’s innate curiosity goes further than just understanding diet and she is also deeply interested and lifestyle factors like sleep, stress and activity. Sarah believes that the true rationale for this way of eating and living stems, not from evolutionary biology (although that is a great place to start for forming hypotheses), but the thousands of scientific articles that each evaluate one small piece to the picture of how diet and lifestyle contribute to health and longevity. Sarah is more than just a scientist. She is also a devoted mom and wife. It was important to Sarah to improve the health of her family in addition to addressed her own health conditions. Sarah successfully transitioned her originally skeptic husband and two spirited young daughters to a paleo diet and lifestyle. It was a slow road (full of challenges, victories and baby steps), but the difference in her family’s health was also profound. Sarah blogs about the challenges of raising a paleo family and living in a family where the members of different dietary requirements. In fact, it was this part of Sarah’s journey and Sarah’s indentify first and foremost as a mom that inspired the name of this blog. Sarah has also always loved food and loved cooking. She loves being creative in the kitchen and finding ways to reinvent old favorites. She cooks mostly for her family, which is why you will see such a diversity of recipes on her blog. She believes that even healthy food should taste amazing and that there can be room in life for celebrations with food and occasional treats (and that what occasional means is individual). Sarah also loves to draw, and yes, both the stick figure illustrations and the more technical illustrations (in this blog and Sarah’s books) are her own.